Flooding is one of the most expensive, widespread and recurrent natural hazards in Tasmania. Many organisations undertake complementary aspects of the flood management in this State, including Local Councils, State Government Departments, Government Business Enterprises, Commonwealth Agencies and the community. 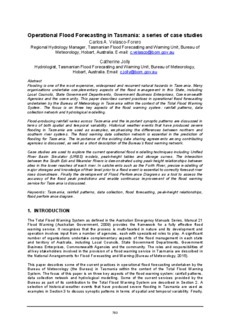 This paper describes current practices in operational flood forecasting undertaken by the Bureau of Meteorology in Tasmania within the context of the Total Flood Warning System. The focus is on three key aspects of the flood warning system: rainfall patterns, data collection network and hydrological modelling. Flood-producing rainfall varies across Tasmania and the important synoptic patterns are discussed in terms of both spatial and temporal variability. Historical weather events that have produced severe flooding in Tasmania are used as examples, emphasising the differences between northern and southern river systems. The flood warning data collection network is essential in the prediction of flooding for Tasmania. The importance of the existing data sharing agreements among contributing agencies is discussed, as well as a short description of the Bureau's flood warning network. Case studies are used to explore the current operational flood modelling techniques including Unified River Basin Simulator (URBS) models, peak-height tables and storage curves. The interaction between the South Esk and Meander Rivers is demonstrated using peak height relationships between sites in the lower reaches of each river. In catchments such as the Forth River, precise modelling of major storages and knowledge of their level prior to a flood event is essential to correctly forecast river rises downstream. Finally the development of Flood Performance Diagrams as a tool to assess the accuracy of the flood peak predictions and enable continuous improvement of the flood warning service for Tasmania is discussed.